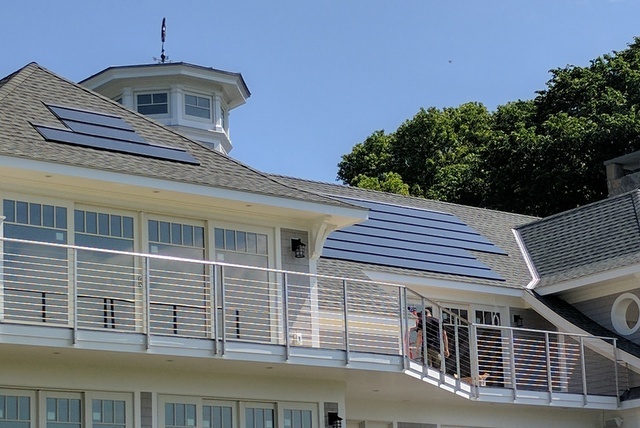 Solar shingles are now available for installation by Sunrise Solar Solutions LLC, the premier residential and commercial installer of solar PV systems in Westchester County, the Hudson Valley and the entire New York Metro area. Solar shingles have become an extremely popular and sought-after energy option for home and business owners enticed by the aesthetically-appealing, seamless appearance of a solar shingles roof, combined with a relatively quick and easy installation, and significant federal and state tax credits and incentives. Hertz added that the “timing (for unveiling solar shingles) couldn’t be better” because the current federal and state tax credits and incentives remain significant and in full effect until 2019, when the rates at that time will then start to decrease. Solar shingles — photovoltaic cells designed to look like and integrate with conventional asphalt roof shingles — get installed over new or existing roof sheathing and can generate enough electricity to power a whole house. The solar shingle roof combines the benefits of solar power with the reliability of traditional roof shingles, and is used in place of roofing materials to provide the same protection from the elements as you would have from regular asphalt shingles. Sunrise Solar Solutions has partnered with New York-based SunTegra, formerly known as Integrated Solar Technology (IST), a solar products company known for developing high-quality, innovative solar solutions. The company’s administrative offices are in Portchester and their manufacturing facility is located in Highland, NY. SunTegra Solar Shingles attach directly to a roof and integrate with composition shingles and other low profile roofing materials, offering customers a durable and protective roof material and a high-performing solar system in one. The lightweight design and integrated wiring reduces complexity and increases the speed of installation.